Yonex was founded in 1946 as a manufacturer of wooden products. Since 1957, starting with badminton racquets, we have been making steady progress as a sporting-goods manufacturer. Through the course of time, we have been growing through a series of challenges to develop products which exceeds consumers’ expectations. This has always been based on a ‟hands-on approach”, keeping close relationships with customers, with our corporate philosophy of “Contributing to the world through innovative technology and the highest quality products”. 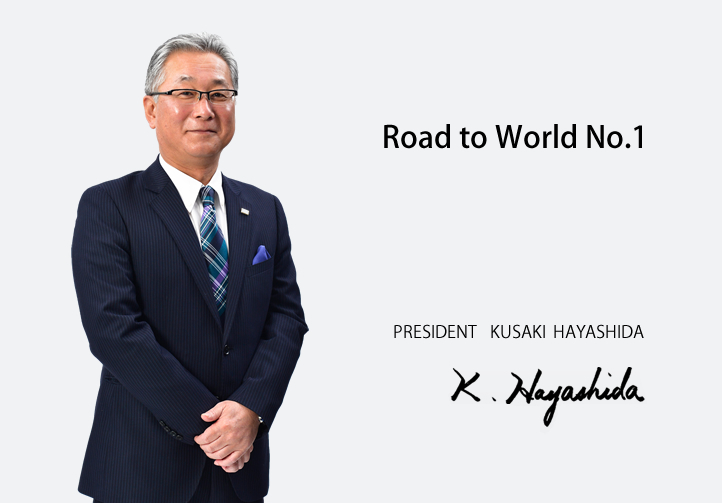 Since I was appointed as the president, my aim has always remained the same - to pursue the “highest quality” and to achieve “World No.1”. All of us at Yonex need to think thoroughly, express our own opinions, put them into practice, and for the best of our daily activities. Each “No.1” effort should come together to create the products we provide with confidence and pride, making it possible for us to share the joy of sports with customers. This is what we have to do as Yonex, as a manufacturer. Sports connect people beyond borders. To be there for all who love sports, we, as a manufacturer, will continue to work our hardest for the Road to World No.1. Copyright © 2019 YONEX Co., Ltd.